Tissintite is a new vacancy-rich, high-pressure clinopyroxene, with a composition essentially equivalent to plagioclase. It was discovered in maskelynite (shocked plagioclase) and is commonly observed included within, or in contact with, shock-melt pockets in the Tissint meteorite, a depleted olivine-phyric shergottite fall from Mars. 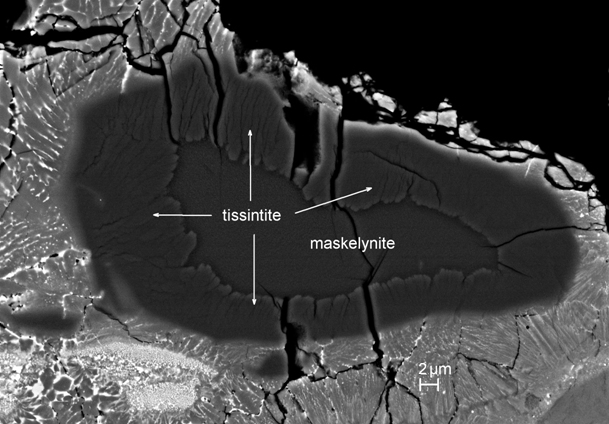 The simple composition of tissintite (An58–69) and its precursor plagioclase (An59–69) together with the limited occurrence, both spatially (only in maskelynite less than ∼25 μm of a shock melt pocket) and in terms of bulk composition, make tissintite a “goldilocks” phase. It formed during a shock event severe enough to allow nucleation and growth of vacancy-rich clinopyroxene from a melt of not too calcic and not too sodic plagioclase composition that was neither too hot nor too cold. With experimental calibration, these limitations on occurrence can be used to place strong constraints on the thermal history of a shock event. The kinetics for nucleation and growth of tissintite are probably slower for more-sodic plagioclase precursors, so tissintite is most likely to occur in depleted olivine-phyric shergottites like Tissint and other highly shocked meteorites and lunar and terrestrial rocks that consistently contained calcic plagioclase precursors in the appropriate compositional range for a shock of given intensity. Tissintite, (Ca0.45Na0.31□0.24)(Al0.97Fe0.03Mg0.01)(Si1.80Al0.20)O6, is a C2/cclinopyroxene, containing 42–60 mol% of the Ca-Eskola component, by far the highest known. The cell parameters are a =9.21(17)Å, b =9.09(4) Å, c=5.20(2) Å, β=109.6(9)°, V=410(8) Å3, Z=4. The density is 3.32 g/cm3 and we estimate a cell volume for the Ca-Eskola end-member pyroxene of 411 ±13 Å3, which is consistent with a previous estimate and, therefore, supports the importance of this component in clinopyroxenes from ultra-high pressure metamorphic rocks from the Earth’s upper mantle. At least in C2/c clinopyroxenes as sodic as tissintite, the a-and b-cell parameters as a function of vacancy concentration intersect at ∼0.3 vacancies pfu, much lower than the Ca-Eskola end-member (0.5), an inversion of anisotropy suggesting an elastic instability that drives clinopyroxene toward a disordered trigonal structure closely related to that of wadeite; it may mark the boundary beyond which the breakdown of vacancy-rich clinopyroxene to a wadeite-structured phase + stishovite becomes stable, although this was not observed in Tissint.